First, place the syrup ingredients in a pot and bring to a boil. Then, boil for 5-8 minutes. Let it cool thoroughly. In a bowl; mix egg white, sugar, hazelnuts and cinnamon. Flatten puff pastry sheets with a roller. Then, place some hazelnut mixture in the middle and close up the ends on top of each other. Flip inversely and cut into square pieces (see the picture). Arrange them over a greased oven tray and glaze with egg yolk. Then, make strips over each one with a fork. Bake in the preheated 400 F (200 C) oven till they get lightly brown. Pour the cooled syrup all over the hot Samsa Dessert after taking out of the oven. Wait at least 30 minutes for the dessert to absorb the syrup. Ilk once serbeti hazrilamak icin malzemeleri bir tencereye alin ve yaklasik 5-8 dakika kaynatin. Sogumaya birakin. Bir kasede findik, seker, yumurta aki ve tarcini karistirin. Milfoy hamurlarini merdane ile iyice acin. Ortalarina findik harcindan koyarak kenarlarini ust uste kapatin. Ters cevirin ve kare seklinde yaridan kesin (resime bakiniz). Yaglanmis firin tepsisine aralikli olarak dizin. 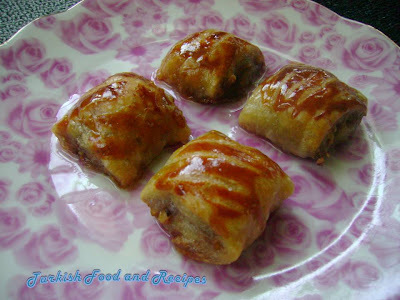 Uzerlerine yumurta sarisi surun ve catal ile cizikler yapin. Onceden isitilmis 200 C (400 F) firinda uzerleri kizarana dek pisirin. Firindan cikarinca, sicak tatlinin uzerine soguk surubu dokun. En az 30 dakika boyunca tatlinin surubu cekmesini bekleyin.